It is precisely because I like Prada so much that last year's Infusion de Fleur d’Oranger was such a disappointment. It was the first in a new series of limited editions, the Ephemeral Infusions.2 According to Andrier, the "idea of Infusion is almost as an imprint of the chosen material in water, a kind of watercolor fragrance reworked with colorful pastel crayon"3 — doesn't that sound delightful? And it worked out perfectly, for me anyway, in the original that preceded the series, Prada Infusion d'Iris, and also in Prada's recent L'Eau Ambrée, which was not part of the series but which took a very similar approach. In Fleur d'Oranger, the approach fell flat; with apologies to its fans, it reminded me of baby aspirin and laundry detergent. So, now we're at year two of the Ephemeral Infusions, and Prada has two offerings: Infusion De Vétiver, which Kevin will cover tomorrow, and Infusion de Tubéreuse, my subject today. Tuberose is one of my favorite flowers, and as usual Prada has done a fabulous job on the packaging: even the outer boxes are gorgeous. But alas, I am disappointed yet again. The notes for Infusion de Tubéreuse include tuberose, petitgrain, blood orange and dynamone (an aromachemical with a 'tenacious faintly amber like odor'), and it's described as a crisp green floral. In the very early stages, it is a crisp green floral, with lots of juicy orange and leafy green undertones, and vague floral notes over a pale base that recalls Infusion d'Iris. The crispness doesn't last — it so rarely does — and what we're left with then is the vague floral. Andrier had noted that Infusion de Tubéreuse uses "the fresh green buds of tuberose, rather than the very sweet lactonique mature petals", so I wasn't expecting a tuberose powerhouse à la Piguet Fracas. And I have no objection to a water-y, easy-to-wear tuberose: I do like Diptyque's Do Son, for example. But the tuberose in Infusion de Tubéreuse isn't just watered down, it's sanitized — that is, all the elements that make one think of tuberose are missing. If the fragrance wasn't called Infusion de Tubéreuse, I'm not sure I would have known that's what it was about. Worn next to Do Son, the Prada just seems wimpy, like it's afraid to speak up lest it offend someone. It does not help that the lasting power is less than wonderful: it seems to fizzle out just when I am hoping things might start getting interesting. If you weren't after tuberose to begin with, Infusion de Tubéreuse might perhaps please you more than it did me, although I'm not sure I'd love it even if it was called Infusion de Fleur Nonspécifique — it does not annoy me, as did Infusion de Fleur d'Oranger, but it's too pale and faint and clean to captivate. 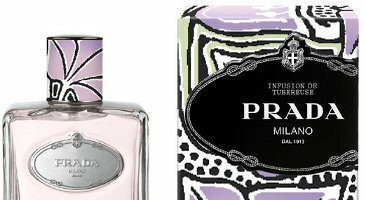 Prada Infusion de Tubéreuse is available in 50 ($74), 100 ($100) and 200 (price unknown) ml Eau de Parfum. 1. See Everything’s coming up rarities at How To Spend It. 2. Although how limited they are is hard to say. When Infusion de Fleur d'Oranger launched last year, Prada said it would only be on counter 4 months, but lo and behold, it's everywhere again this spring, even in new gift sets. Whether that means it sold so very well that they couldn't resist launching it again, or so very badly that they're hoping to unload what's left of their stock, I have no idea. 3. From Women's Wear Daily, 3/12/2010. Try & see what you think — am going to be curious to see if everyone loves this but me. Curious to give this a sniff (and to finally sniff the Oranger as well), but Prada is not my favorite. I don’t dislike it, it just does almost nothing for me. Infusion d’Iris was fine now and then, but I gave my bottle away because it was just… boring. Eau d’Ambree is okay, but there are so many other things I’d rather wear (I was more wowed by YR Voile d’Ambre), so no desire for a bottle there either. Highly doubt this will be up my alley either, but that’s fine with me. I’d rather dab on one tiny drop of Carnal Flower or of my just-received Tubéreuse Criminelle decant when I want a light fix of tuberose. Thanks for the review. Joe, then really doubt this will be the one that will change your mind about Prada! I like their style and even then, this one is just not interesting enough. Well, as someone who went to bed last night in a cloud of Carnal Flower I was guessing this wouldn’t be up my alley, anyway, LOL. Too bad it doesn’t stand up as a watery, green version, though. I like Do Son now and then. I like both Carnal Flower and Do Son — and you know I love “watercolor” perfumes. This one is just sort of drab. I do hate to use that word because I do love Prada and I do love Daniela Andrier, but sadly, that’s how it strikes me. I tried this at Nordstrom last weekend and find your review to be spot on. It was okay. With Fracas EDP and Parfum in my collection I see no reason to buy the Prada. I do think someone looking for an office or church friendly tuberose might find this to be pleasant and wearable. In that sense I guess its wimpyness could also be its strength…but I’m passing on this one. Love, love, love the packaging though. Infusion d’Iris was such a balancing act — you could also wear it to church or office, but it wasn’t wimpy or drab, at least to me. This one, I don’t know — something is missing. You’re right, the Iris does have that extra oomph that the Tuberose doesn’t, yet it manages to stay pretty close to the skin. IIRC, he does not like the Infusion d’Iris at all, so cannot see how he would possibly like this one! I love the packaging too. Each and everyone of the infusions is stunning. But my favorite (in terms of presentation) is the original IDI. Soooo elegant…too bad I really cannot bear it. It’s the one I dislike the most. Might turn out I’m not the Infusion type either, although I did love the first one. I haven’t liked any of the Pradas, but then I feel like I can’t fault them. They’ve all either been things I’m not wildly in love with (orange blossom, tuberose) or can’t smell at all (iris). However, vetiver is different story, and I am looking forward to Kevin’s review. I admit I’m hoping that A.) the packaging is the same, and B.) that I like it, because I like the packaging. That packaging is gorgeous too…different, more masculine pattern, but still. dont get your hopes up. I dont know what Kevin will say, but i like vetiver, and i think Infusion de Vetiver is pretty bad. The packaging is the same tho. I’ve liked everything I’ve tried from Prada thus far, even the wonderfully soapy Oranger. All the perfumes I own from this company have poor staying power. I don’t know if it is my skin or all the citrus (I don’t have that problem with Eau d’Hadrien in EDP), so I wait until they hit the discounters. Given I wear Fracas or Straight to Heaven for a tuberose fix, I don’t know how this will hold up. But if I want something light and nonoffensive, it sounds like it will work. And really, Infusion d’Iris was so great it did leave some pretty huge designer shoes to fill. See, Infusion d’Iris has fabulous staying power on me. All day, and then some. This one does not at all. That’s amazing about the staying power. I snapped up the Iris at our retail store and do enjoy the scent — for the five minutes it lasts, even generously applied! I knew from the review it was light but this was LITE. Thanks for the review! I do wonder if you’re anosmic to something in it then…or if it just induces olfactory fatigue. Ack, that’s disappointing! I thought that L’Eau Ambrée was an amber perfume diluted to homoeopathic concentration and it sounds like they did the same with tuberose. Ah, well. Out of the two. I was more curious about the vetiver so looking forward to see what Kevin has to say about that one. I am not an amber freak, so had no quarrel with the L’Eau Ambree even though I can see your point. I just thought it smelled great, even if it wasn’t much of an amber. This one, dunno. Does not smell great to me. Just ok.
“Homeopathic” is one of my favorite adjectives to use (mostly in my head) when I mean wimpy or weak perfume… but I don’t say it often because I’m not sure if most people know the connotation. I picked it up from a comedian who used it in a routine about how poor their family was and kept adding water to the Kool-Aid until it was “like a homeopathic Kool-Aid”… still cracks me up thinking of that phrase. I may have to give this a sniff, since a mild tuberose may do the trick for me. I want to love “Fracas”, but it’s just too intense though beautiful … ditto for Estee Lauder PC Tuberose Gardenia. So maybe wan and pink is my style! I love Infusion d’Iris – can’t wait to hear what Kevin says about vetiver, since you can never have too many vetivers. Do try Diptyque Do Son as well if you haven’t already! I think it’s a great mild tuberose. I’m glad to see the positive comments about Do Son. If any of you try it, don’t dismiss it too soon. Give it a chance to bloom on your skin. It’s especially nice on a hot day in a sultry climate. I was recently decanting some, and I got some on the little towel put underneath to catch errant sprays and drips. I hung the towel in my home office area (partly to counteract the litter box aroma, LOL), and I was surprised at the lasting power the Do Son had on cloth. The room was filled with a gentle, natural-smelling tuberose! Well, you all just put Do Son at the top of my sniff list! Your towel experience sounds wonderful, Haunani. Oh, boo. How disappointing – I like Infusion d’Iris and I quite like L’eau Ambree (although I’m waiting for steeper discounts). I still haven’t tried the orange and I was really looking forward to this one. I’ll still check it out, but now I’m not salivating anymore. For which I should be grateful. Oh darn, and such lovely packaging too! I love L’Eau Ambree even though it is rather light and isn’t the most exciting or complex fragrance….but as others have mentioned previously –it really does layer with just about anything! Love Infusion d’Iris as well–especially when mixed with Hermes Hiris. Infusion d’Oranger was very blah and disappointing. Robin, you really nailed it: baby aspirin and soap. I really want to sniff the Tuberose just to see (smell) for myself , but it doesn’t sound very promising. Ooh… I hadn’t thought about layering it with Hiris. Of course, I’d have to *get* more than a sample of Hiris before that would be practical. Yay! They didn’t have super good prices on the ‘Bay anyway – so I’m happy to wait. I forgot about the 10ml of Hiris – whoever ends up cleaning out my house when I die isn’t going to know what the hell to think. I’ll have to find a novice perfumista when the end is near and ship him or her all my decants – I’d hate to think of someone philistine throwing them all out. I think that it just became official – I’m nuts. we’ll all cross our fingers that your sister’s baby is born with the perfumista (or perfumisto) gene…..then you just need to hang in there for another 25-30 years until she/he is old enough to appreciate the legacy…. I like to plan ahead…. lol – I already told her that if the baby is a girl, I’m introducing her to good shoes and good perfume. If it’s a boy, the CEO is planning on teaching him how to shoot and how to properly barbecue. I think that he still should do those things if the baby is a girl. I think YOU should stick with your plan if it’s a boy. Hi-top Chucks and Eau Sauvage, baby. So far I only have one niece, and she’s waaaay ahead of me on the shoes biz. I gave her some Kenzo Magnolia for her birthday (her 9th! ), though. That is true – it would be my solemn duty to save my nephew from the horrors of Axe body spray. save him from the horrors of Axe-phyxiation….save the surrounding community as well…. Oh, do give it a shot. Somebody is going to love it. Just not me. Oh well, at least I don’t have to add this to my ‘lust after’ list. I liked the original Prada. I do still like it but it doesn’t excite me as much as it once did since expanding my horizons beyond dept. store fragrances. Might as well give it a shot, but yeah, nice to have something you don’t have to lust after. So, I’ve been lurking on the site for almost a year now. I’ve finally decided to join. Yay!! I’m a little disappointed because I expected so much, seeing as how tuberose is one of my favorite fragrances. I’ve already purchased this set from Nordstrom without smelling it and I will be picking it up tomorrow. I hope I’m not too disappointed…I do love d’iris. Welcome! you’re going to the store to pick it up? Maybe you can get a sniff and/or a sample while you are there….could be you’ll be pleasantly surprised and happy with the purchase….and if you hate it I’m sure you could get a refund or exchange it for something else…after all they’d know it was new and still sealed. You may be disappointed if you already have many other Tuberoses to compare it with, but I don’t think you’ll dislike it. Hi and welcome! I do hope you’ll love it. If not, I’m sure they’ll take it back. I love Infusion d’Iris and L’Eau d’Ambree but I’m almost glad the reviews are not good on the Tuberose–that way I’ll save up my money for another perfume on my wish list. Today I’m wearing EL’s PC Tuberose Gardenia–I haven’t worn it since early last Fall and had almost forgotten how pretty it is. I pulled that one out yesterday after putting it away back in September and swooned with delight. That takes care of that then! OK, so this was not a ‘crisp green flora’. Very sad. But, what would be a Crisp Green Floral?? Any suggestions? Oh, I was not saying it isn’t a crisp green floral — most scents that start crisp soften, so didn’t mean that as a criticism, necessarily. But it isn’t an exciting crisp green floral, I guess! Will try to think of more, and hope others will chime in. Chamade is a green floral, but not so very crisp after it settles out of its galbanum start. Same deal with Balmain Ivoire. I would second all of Mals86 recs, plus add the original Chanel’s Cristalle in edt formulation (not the new Eau Vert reformulation), Le Labo’s Bergamott 22, Speziali Fiorentini-Fig and Poppy and last but not least, Christian Dior’s Diorissimo. Get this one in vintage or extrait if you can. For green crisp floral I also love No. 19, though it’s SO formal/elegant, and I definitely like Chanel Cristalle Eau Verte, Balmain Vent Vert, and Estee Lauder Aliage. Also worth trying the new PG Papyrus de Ciane and Byredo Green. My bergdorf card thanks you very much Robin! HA! I must say, I wish the juice was good cause that bottle is Fabulous! Excited about the new L’artisan tuberose. Oh, I’m looking forward to that one too! but I might be wrong, of course! I am very curious to hear what you’ll think of it. I’m curious too! and expecting to like it, LOL…do you know something I don’t? So this is like the Ghost of Tuberose drifted by? Well, o-KAY then. I’ll be disappointed. If you can, try it w/o thinking about the name: maybe you’ll like it that way. Although I didn’t. I think…….deep breath, sip of hot tea……..*whispers* I don’t like tuberose. Oh god, don’t look at me, don’t look at me! I’m HIDEOUS! What’s WRONG with me? All the cool kids love tuberose! Tuberose is chic! It’s sophisticated! I want to be a tuberosian! But it just smells so, well, pornographic to me. Fracas, Tubereuse Criminelle and Carnal Flower all make me feel like I’m standing in the middle of Harrods wearing only high heels and elbow-length gloves, and brandishing a riding crop. Can anyone help me find a tuberose scent to help me escape my maidenly aversion? Or even a mental perspective that will let me stop blushing and enjoy its ripe, come-here-loverboy personality? Do you think this Prada tuberose might be a good gateway scent, or is it so attenuated and wimpy that it’s not really a “true” tuberose? How do I break through? Hey, we ALL have notes we don’t like — why not just live with it, LOL? But if you want a gateway, try Diptyque Do Son. I’m sure there are people who are going to like the Prada, but IMHO, if you do like it, it does not follow that you’ll be learning to love tuberose. Thank you all for so many wonderful gentle tuberose recommendations! I really appreciate them, and can’t wait to start sniffing. And thank you for not making me sit alone at lunch. I can’t wear Fracas or Beyond Love and I haven’t tried Carnal Flowers yet, so I definitely don’t like all tuberose. But, have you tried Estee Lauder’s Tuberose Gardenia? To me, it leans more towards the gardenia, but it’s very ladylike and not carnal at all. I second TG! It is as pretty as Audrey Hepburn in Sabrina! Really a lovely scent. On the other hand, if you are looking for the buttery-sensual-comfy scent of tuberose without the thorns (i.e. without tuberose) I suggest one of the most delightful fragrances I stumbled upon recently: Jabu, buy Mona Di Orio. I think it is supremely likeable. And it felt like what I like best of my tuberose scents, when they are both inocent and sensual, comforting and interesting! (It features orange blossom and ylang ylang instead of tuberose). P.S. The tuberose *ho* here says she hated tuberose il y a one year ago. Then something happened, all at once, and now I just can’t get enough! P.P.S. Now I’m really craving a tubey fix, and I’m wearing something totally different. An orange/ambery thing which I don’t like. I haven’t tried the Estee Lauder yet–scared off by the name, chicken that I am. But I will! And Zazie, your description of Jabu sounds enchanting. It sounds like it might be perfect for me. I’ll report back, post-sniffing! You just described the Kim Kardashian frag. and ads really well. Whips and chains and tuberose. Chanterais: if you’re interested in a gateway tuberose, you might check Angela’s review the other day of Histoires de Parfums Tubereuse 3 L’Animale. I like that and their Tubereuse 1 La Capricieuse. Neither is so “tuberose foreward” as many others, and #1 especially is a beautiful light combination of iris, suede, and tuberose… it dries down to a lovely light scent. But as Robin said, you can still be one of the cool kids even if you HATE tuberose! True perfumistas don’t judge! Excellent! L’Animale, here I come. Ta for the kindness, Joe. My gateway tuberose was Annick Goutal’s Passion. I felt the same way as you about tuberose up until a few months ago, that it’s too fleshy and I couldn’t identify with that smell at all. But I love almost every single Goutal I have tried, so I kept an open mind when came across Passion. And I loved it! It’s both fleshy and Goutal-ishly light. And now I want more tuberose! I think it’s true what Robin says that there will always be notes you don’t like. But when you’re haunted by a note I find it’s so rewarding if you finally “get” it. Seems like you’re haunted by tuberose and I bet the right one for you is out there. What???? Wearing tuberose makes some women feel like they are “standing in the middle of Harrods wearing only high heels and elbow-length gloves, and brandishing a riding crop?” Why, oh why, has it taken me so long to find you Tuberose? Apparently I shoulda been wearing this every day. I have the bullwhip (okay, not a riding crop by still) hanging on my office wall already. I kid you not…you would too if you had to work with my oft unruly but always amazing crew of coworkers. Well, nothing says “I mean business!” like a bullwhip on your wall! The only one of the series I like so far is the Infusion d’Iris-I’ll sniff this one but not get my hopes up. I like tuberose but it sometimes inspires migraines so have to be careful…..
I’ve also got a nearly full bottle of EL PCTG. So no need to rush out and buy! I discovereed it only a couple of weeks ago, and I bough it on the spot. I loved it, loved it , loved it! But as Cynthia said somewhere above, to my nose TG is more “G” that “T”!!! Will be shocked if this is tuberose-heavy enough to give you a migraine! i like the comparisons (or at least references to EL PCTG) because i am planning on buying either for my mother-in-law’s birthday. she loves any and all tuberose (loved Jo Malone Tuberose) or any white floral perfume really, so trying to decide what she would prefer. of course i’ll have to go to nordstrom’s/bloomies to take a sniff myself right? robin, thanks for the review!! Hope you find something she loves! oh i finally tried IDT!! i was so excited – the packaging so adorable, but you are totally right on Robin. the tuberose essence barely there when sprayed on, and then it faded into something very sweet and nondescript. i could smell the same “base” as IDI as it sort of faded in a similar fashion on my skin, but IDT was so faint. Robin, I get a totally different impression, but from what I read so far I might be the only one…. I couldn’t bear the sweetness, am I really the only one feeling it is tooth-achingly sugary? It is a nose effect, not skin chemistry: I smelled CANDY also on mouillette! Interesting. It is sweet, you’re right, but on me not so terribly sweet as to be toothache sweet. Maybe just because it is so light? I keep thinking of it as “dainty”. Wow, Robin you’ve reached the same conclusion as Kevin on the two new Infusion fragrances – wimpy and pale. True. Kevin pointed out that we could have just changed a few words and used the same review. Personally, I thought the vetiver was marginally more interesting than the tuberose, but wasn’t dying to own it either. Could get a whif of it. I found it disappointing. The only Prada I like is the L’eau Ambrée, but not so much as that I need a bottle. I like more than you do, but certainly agree this one was a disappointment. Prada Infusion de Tubereuse IS okay did not enjoy smelling this EAU my faveorite prada is l’eau ambree ! Prada Infusion de Tubereuse is like old lady status! Good thing I read that before I left my comment! Old lady is the first thing that came to mind. Not awesome, stylish, wise old lady, but stuffy old lady. It’s a couple of hours later now and the dry down is nice enough. The stuffiness is gone and it smells light and watery now, but still not overly tuberose-y. In fact, it reminds me of Prada’s Infusion d’Oranger (which I love and own, in addition to Infusion d’Iris, which I douse myself in daily). I thought I’d love this, but at least this way I’ll have money to spend on an Aqua Allegoria or two! I got a sample at Neiman’s on Sunday and tried it today. I like the scent – I love heady florals but tuberose has never been a favored note for me. I was hoping that this being watered down, I might be able to wear a tuberose for once. And as it turns out, I think the scent is great. But on me the lasting power was NIL. Barely an hour, it seemed. Disappointed. Maybe I could try the lotion and it would last? ugh. Interested to check out Diptyque Do Son, now, though. I would love to be able to wear/like a tuberose. Try spraying some on your clothing, that might help. Loved, loved, loved this perfume ! It’s been 5 years and still searching for it on amazon etc. It really makes me feel happy, and guess what ! It is the only Prada perfume that lasts (for me) for HOURS. I never searched for tuberose’s perfumes and I tried this without even knowing how this flower smells. That was it, I fell in love. Then I smelled the real flower and didn’t like it that much.